inventiveness will amaze and inspire you! THIS ATMOSPHERIC PIZZA IS MADE OF CARDBOARD! Andrew Milner, from Huddersfield, West Yorkshire, England, built this stunning 18x16in (45x40cm) pizza layout in order to enter a competition in the Gnatterbox, the celebrated Gn15 online forum. 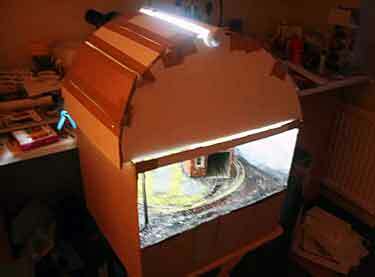 The challenge was to build a layout whose structure and scenic elements were entirely made from cardboard! 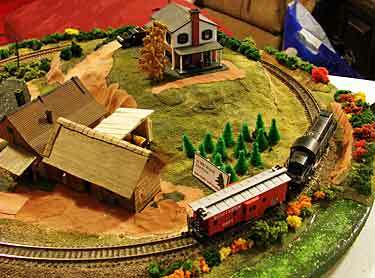 Andrew’s layout complies with that requirement – from corrugated cardboard baseboard to cardstock building and papier-mâché landscape. In addition, Andrew created a unique lighting system (lower left photo), a lightbox using a battery-operated fluorescent tube in a white box with a diffuser (tracing paper) to give the effect of an overcast day. The results are evident from these wonderful, atmospheric photographs. And there’s more. 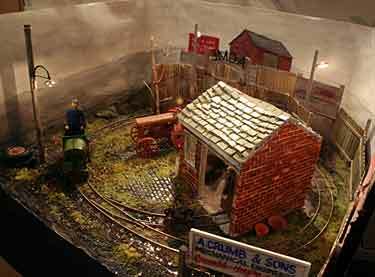 The angle grinder being used inside the loco shop also throws a realistic trail of sparks. “I wanted to incorporate more animation effects but ran out of time,” Andrew comments. 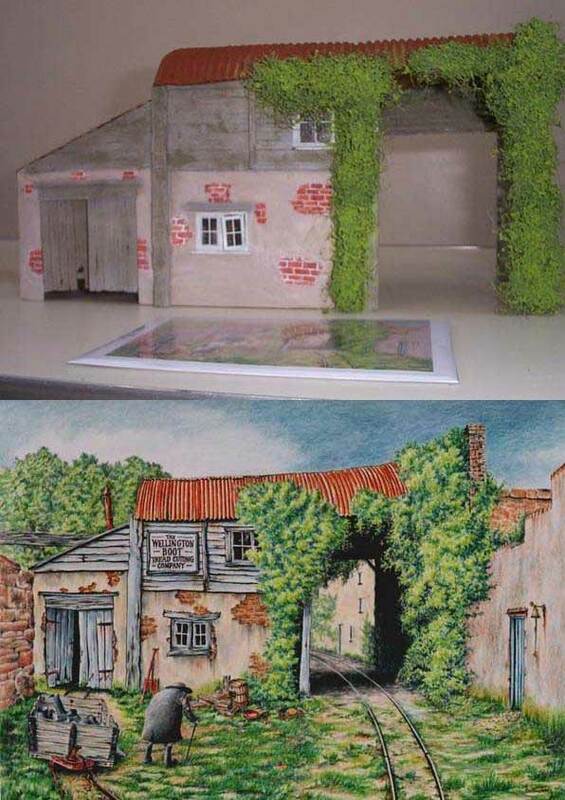 “I’m also pleased that at the age of 45 and with 35 years or more of armchair modelling, thanks to your site (it was the link from your pages) I finally built a layout!” You can see more photos and construction details in Andrew’s thread on the Gnatterbox. The layout, named Arthur Crumb for obvious reasons, placed second against stiff competition. Congratulations, Andrew! Michael-John Idzerda, from London, Ontario, Canada, built this 22in (56cm) diameter pizza on a $4.99 CAN table found at a local thrift shop. 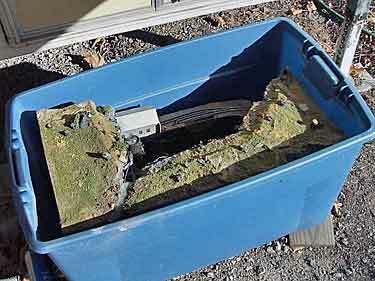 The N-scale track work is simply flex track on cork, with one switch. 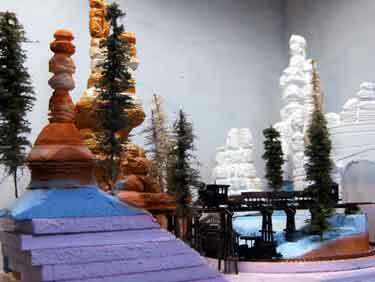 The landscape is made from scored pink foam, painted cream and colored with dyed inks and Woodland Scenics trees. 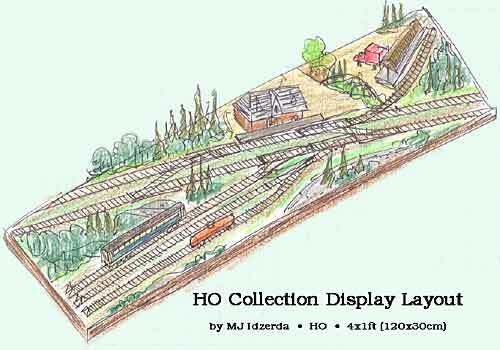 MJ reports that he has already started another pizza layout, this one a trolley line in O scale. Take warning: these little circular track layouts are addictive! VERTICAL-PIZZA TREND REACHES NEW MILESTONE — LIVE STEAM! 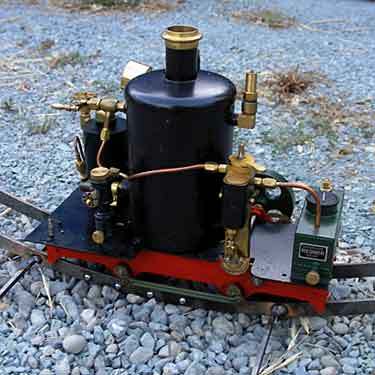 American David Wegmuller has come up with a unique vertical pizza design, where the motive power is a Number 1 gauge (45mm, same as G-gauge) live-steam locomotive! 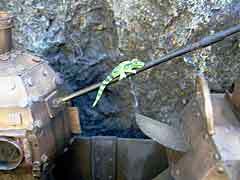 The valiant little lokey, appropriately, has a vertical boiler. There are more pictures at Dave’s website, and you can see this incredible “layout” in action by clicking on the triangle below. Thanks to Englishman Tim Roy for ferreting this one out and sending it to me! For a view of other vertical pizza designs, see Scrapbook #67a. 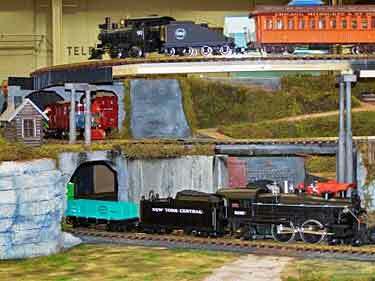 Keith Gamble, from Anderson, Indiana, USA, built the On30 Crooked Branch Coal Co. as a portable layout to take to train shows. 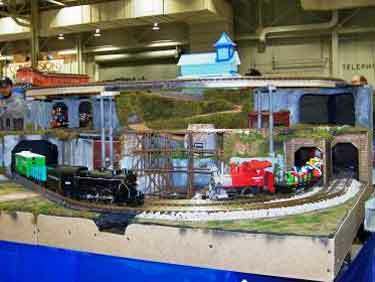 Dennis Vaccaro, from Western Pennsylvania, USA spotted the layout at a club show in Indianapolis and took these photos. 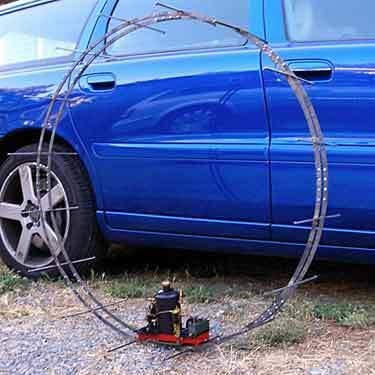 Radius of the end curves is 9in (23cm), and Keith finds his narrow-gauge stock will operate very smoothly at that curvature. The oval has one turnout, to a lone siding, and overall size is 30x20in. I particularly like the way Keith’s bare-branched trees blend into the backscene of similar trees. 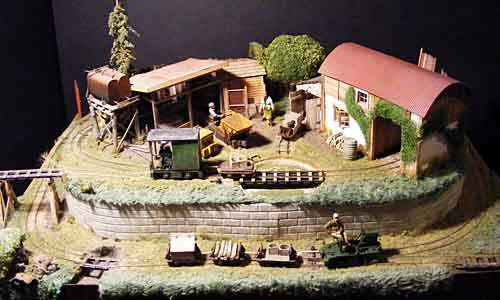 Michael Ebert, from Fürstenfeldbruck, Germany, was inspired after seeing one of my books to attempt his first micro layout. 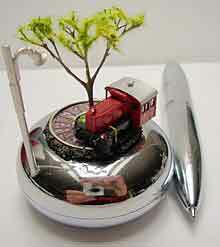 He’s a garden railroader, so his micro was built in Gn15 scale (! 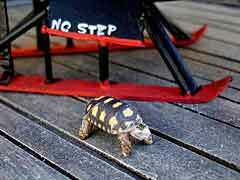 :22.5 running on 16.5mm HO-width track). 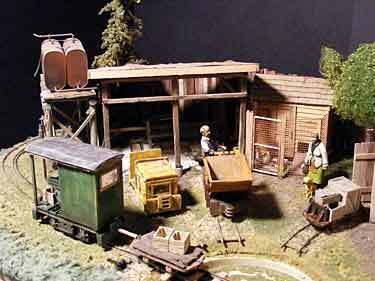 His 30x30cm (1ft square) layout depicts the display stand of a supplier of mining equipment at an industrial fair in the 1960s. 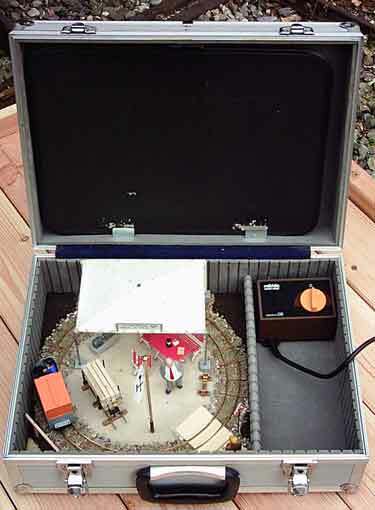 The layout is built on a 5mm plywood board and travels in an aluminum suitcase along with the controller and scratchbuilt rolling stock. 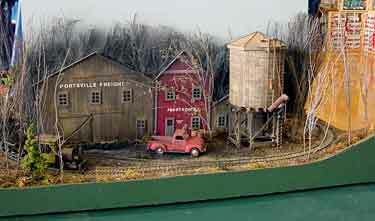 As Michael is fond of technical gimmicks, he also included a couple in this tiny display layout. 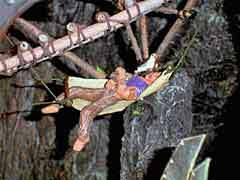 The flagpole is a working model, and each figure is pivoted on one foot to turn it around. Michael is an officer of his model railroad club, Der Modelleisenbahnclub Fürstenfeldbruck. Thanks to fellow club-member Sven Wesenberg, from Munich (München), Germany, who provided all this information (in English!) and took the photographs. The name 10 Mile Branch is taken from a local stream. 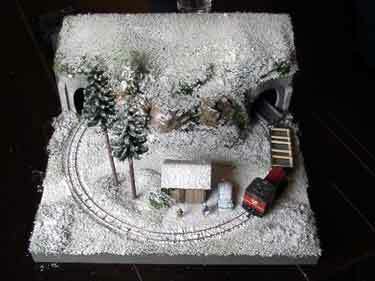 John has put up more photos of the layout on his website, and made a very nice video presentation, shown directly below. Joe Hall, from O’Fallon, Missouri, USA, wanted a pizza style layout for continuous running, but felt the need for something more to enhance operations. His first try at designing a combo layout is shown at right. The plan combines a circular pizza with an Inglenook-style yard. It’s called The Key. If built with Atlas Snap Track sections, it measures 67x40in (170x102cm) and has an 18in (45cm) radius. But Joe was concerned that this design was not prototypical, so he went looking for prototypes to which it might be adapted. And he found some! As Joe put it, “With just a few enhancements, and a quick look on maps.live.com, we can find not only situations that involve switching but also real life pizzas. I submit the railroad museum. There are at least three U.S. railroad museums (and there could be more) that have a circuit of track allowing them to run their equipment in a continuous manner, just like a pizza layout, and they have switching operations as well. – Colorado Railroad Museum, Golden, Colorado. 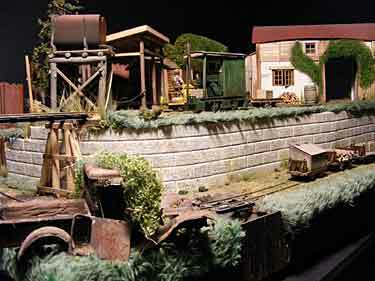 Joe decided to plan a small layout around a railroad museum, noting the advantages of such a plan: you can prototypically run a wide and varied collection of equipment; many museums have a surprising amount of operating capability, including regularly scheduled trains as well as making up and breaking down consists and servicing locomotives; and a connection to the outside world can bring in shipments of coal, oil, rail, ties, and newly acquired equipment and lets you send out shipments of sold, leased or restored equipment. Scott Buschlen, from Brampton, Ontario, Canada, built this two-level (inside-out Figure 8) pizza layout in Gn15 scale. It’s called The Crouton Gin Works of Upper Faylesylvania (honoring two fellow Canadian modelers) and measures 120x72cm (47x28in). 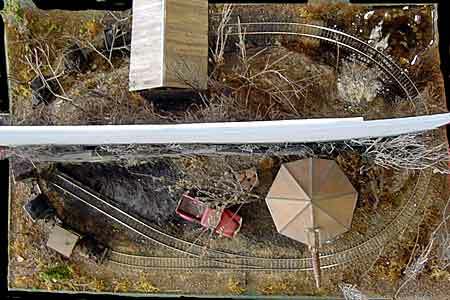 There’s a cleverly hidden—and very steep—pair of inclined tracks at the back, where the main line crossed over itself. Scott admits that the steep grades limit the rolling stock that can be used, but look at the scenic and operating possibilities out front! AND NOW FOR A FRENCH PIZZA LAYOUT — QUICHE LORRAINE! You would expect that France, the home of fine cuisine, would cook up its own unique version of a pizza layout. And so it has. G. Geoffroy, from Neuves-Maisons, France, has unveiled — Quiche Lorraine! 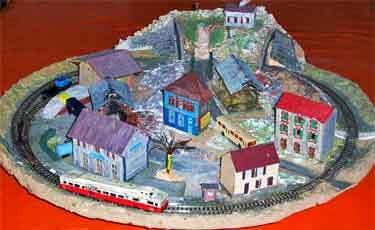 It’s an N-scale pizza layout, 52cm (20.5in) in diameter, with scenery that creates a strong resemblance to its namesake dish (but is made from cardboard and sawdust)! GG, who lives in the Lorraine region of France, has a fine sense of humor that also reveals itself in the video version of his simple layout. Just click on the triangle below (and be sure your sound is on). Turning from the sublime to the ingenious, Fred Miller, from Mount Vernon, Missouri, USA, has built Marksberry Guano Company, a fertilizer-mining operation named in honor (?) of a fellow modeler. It’s an On18 streak of rust, measuring 30x16in (76x40cm) and 17in (43cm) high. It fits into and travels in a standard 45-gallon plastic storage tote (above right). latent desire to run trains in the living room or dining room. And a winter-themed pizza layout usually results! Here’s a sampling from the season just past. 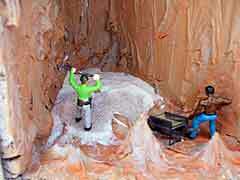 Francesco Zezza, from Rome, Italy, built this N-scale Winter Pizza (aka “The Lost Mine”) in a 60x30cm (24x12in) space. Most of it is recycled—used track, turnout from the garbage bin, reused trees and rocks, etc. Rolling stock is anything on hand… Francesco has carefully avoided any scenery from a specific place (“A pine tree is a pine tree anywhere,” he says), so trains from many countries can run on this layout. 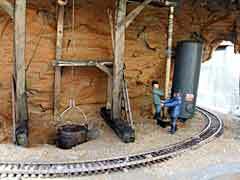 The entrance to a tiny, abandoned mine earned the layout its nickname. 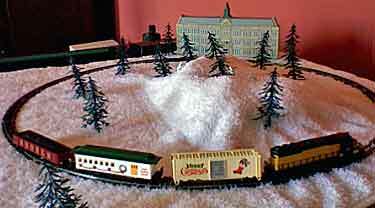 Nathaniel Hopkins, from Lexington, Kentucky, USA, put together this “quickie” N scale pizza to have a train at Christmas. “My wife and I moved into our first house on Halloween… Being a regular reader of your Scrapbook which often features fairly simple thrown-together setups that look great regardless, I decided there was no reason we too shouldn’t have something. 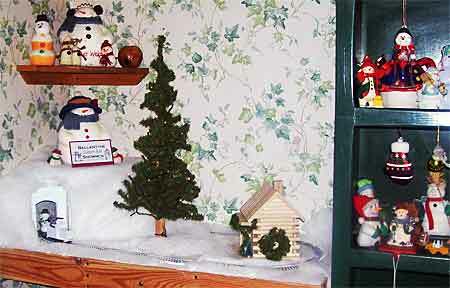 It is built on a less than 24-inch-square piece of scrap plywood… I added a white towel with some crushed paper underneath to make a snowy hill, some scale Preiser polar bears that I had never known what to do with, and some totally out of scale trees that are actually decorations from our wedding cake.” Ingenuity triumphs! 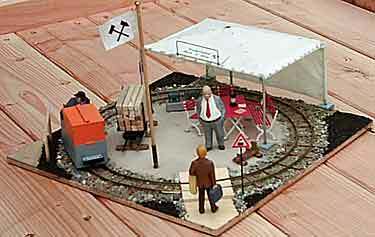 Sven Löffler, from Frankfurt, Germany, built this 33x33cm (13x13in) pizza layout in H0e scale (1:87 on 9mm gauge) using some old Eggerbahn trackage. 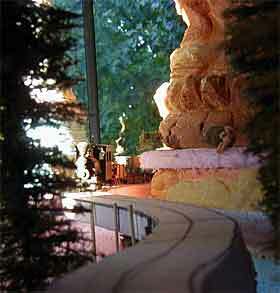 A key feature of the layout is that it can be converted from winter to summer simply by vacuuming away the Noch snow! When winter comes again, the snow can easily be rescattered. 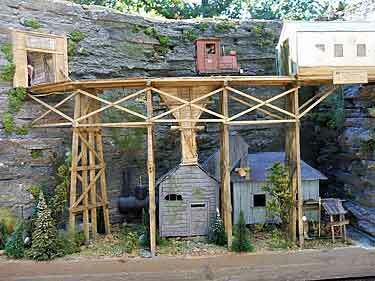 “Being only 8x8ft with four running G-Scale trains, five different types of bridges, a water-fed gristmill, supply house, coke bottling company, two-story train station and plans for general store with gas pumps… that’s a lot in two 4x8ft tables! 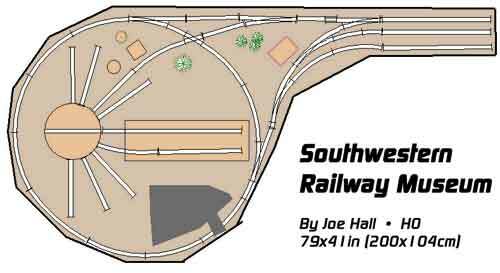 I just thought it might inspire some other arm chair modelers.” So do we, Joe… that’s why we’re running it in the Small Layout Scrapbook! 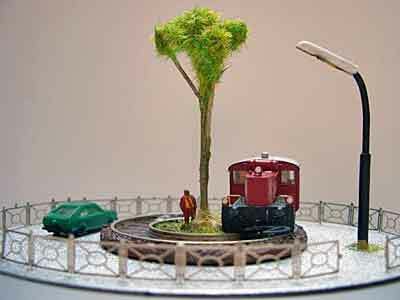 Probably the smallest pizzas on this site are these two Z-scale layouts with a 14mm (.55in) radius, designed and built in Germany by Manfred Sobczak. The bases and track of both layouts were fabricated by Walter Völklein, from Mühlhofen, Germany. 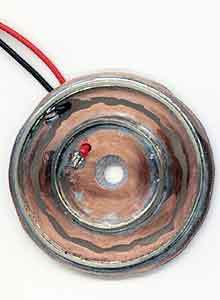 Walter soldered two rings of rail on a copper-clad printed circuit board (upper right), then ground away the cladding to separate the rails electrically. Manfred built the remainder of the layouts on these basic boards. Both layouts are fully functional, and Märklin locomotives like the BR89 shown run comfortably on them. On my screen the photos appear larger than the actual layouts! The larger layout (above left) has a built-in controller, batteries, and switches for power and reversing. The streetlight is also illuminated by batteries. 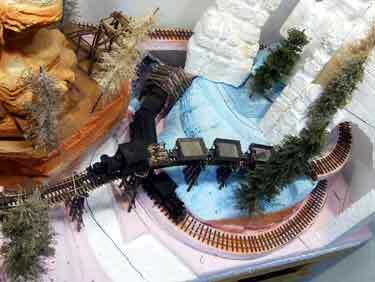 The smaller of the two layouts (lower right), holds a built-in reed-contact and electronics—you control the locomotive and lamp light using a magnetic pen. Manfred warns that locomotives for these layouts require a wheelbase no longer than 12 mm (less than half an inch)! EXTREME SCENERY CAN CREATE A TERRIFIC EFFECT! Steve Jarman, from St. Louis, Missouri, USA, is “reaching for the sky” with the scenery on his 48x24in (120x60cm) two-level On30/0e pizza layout. 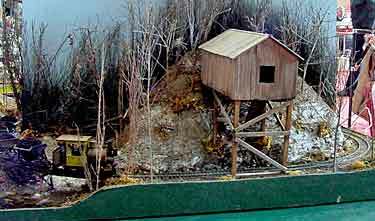 His dramatically developing scenery clearly shows the influence of John Olsen’s work that appeared in Model Railroader magazine a few years back. “But more importantly,” Steve points out, “this layout was designed with sound in mind. 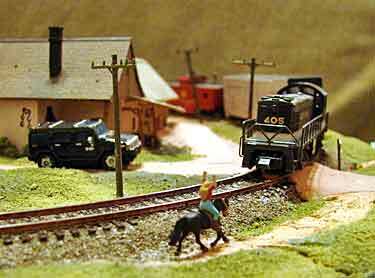 I really want to demonstrate how ambient sounds can make a small layout seem much, much larger. 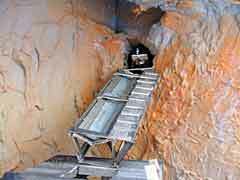 So it has a sound system complete with subwoofer to let you really feel those explosions from deep inside the Jolie Rouge Mine.” Steve is using a combination of audio tracks from Fantasonics to create his sound environment. He’ll also be using onboard train sound, probably an MRC DCC system. For a video progress report, click on the triangle below (and turn the sound up!). Chris Walas, from Santa Barbara, California, USA, built this astonishing two-level pizza, Submarine Pirates Cove, for a contest at the Gn15 forum, Gnatterbox. 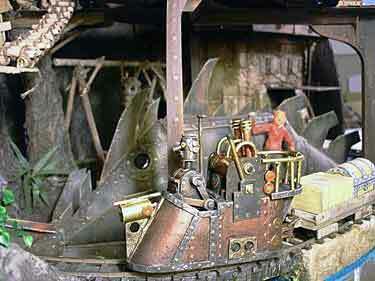 Designed in the Steampunk style, the layout looks like a cross between Johnny Depp and Captain Nemo. Even more astonishing is the fact that it’s built entirely of cardboard and paper! Even the figures and landscape are papier-mâché. 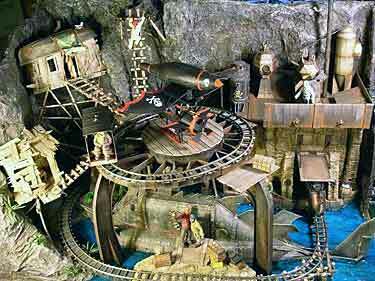 The scene is a concealed lagoon within an extinct volcano, where a pirate band have hidden their fantastic submarine and built a semi-permanent camp. 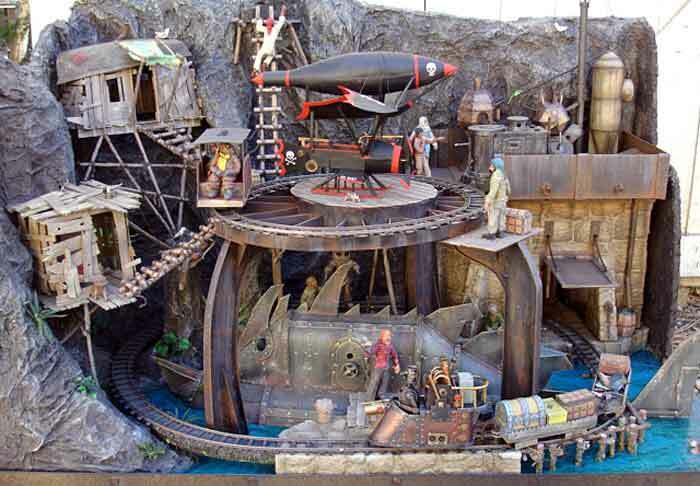 A Gn15 (more or less) scale railway—including a robot-driven locomotive (below right)—hauls supplies and equipement around the lagoon, and a branch overhead serves the needs of the Jolly Roger airship and landing pad. Fantastic and whimsical? Yes. Charming? Definitely! Chris has packed in far too many details to examine each one here. Below are a few examples of the kinds of details (all made from paper and card) that abound here… and there’s a thread on the Gnatterbox that follows the whole process of constructing this amazing layout. Not surprisingly, it won the gold in the competition.